My class is just starting to work on fractions. They should have be able to name simple fractions from second grade but I got a lot of blank looks when we started. They could identify fractions with a numerator of one but it seemed that any other fractions were new to them. Once we started working on those fractions, some students started misnaming the denominator instead of 2/6 they would say 2/4 as in 2 pieces are shaded and 4 are not. I had 5 students that were ready to move on though. Even though they don't seem to have much of a background in fractions either, I thought they could start looking at equivalencies. I didn't want to move too fast though so we started with halves. I started by giving them this question. 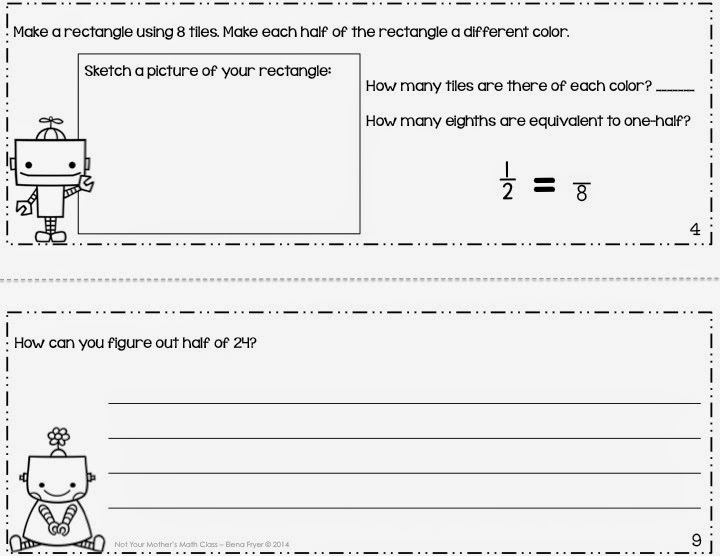 Questions for introducing equivalent fractions. When I pose a challenge question, it is either something that I haven't taught yet or an open ended complex problem. In this case, we are exploring a topic I haven't taught yet. They need to think about it first. Then we may do a turn and talk, write about it before sharing or if we are in a small group (like this instance) just have a discussion. During our discussion, students came to the conclusion that while each robot's pizza had a different number of pieces the amount was the same. They did point out that Robbie's pizza would be more difficult to eat. 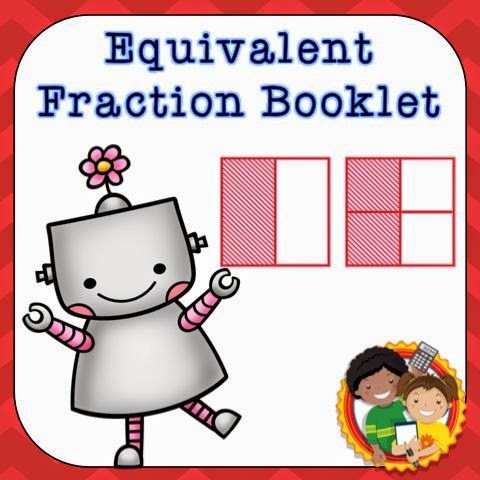 We talked about how these were equivalent fractions, then I showed them the booklets that we were going to use. In your classroom, you could do this activity without the booklets by making a chart for students to record their work on. To complete the task, students used a specified number of tiles to make a fraction that had the same number of red tiles and blue tiles. On page 4 (pictured below), students make a rectangle with 8 tiles, half of the tiles were red and half were blue. Some students wanted to sketch their picture without using tiles. For this activity though, I insisted that they use manipulatives. 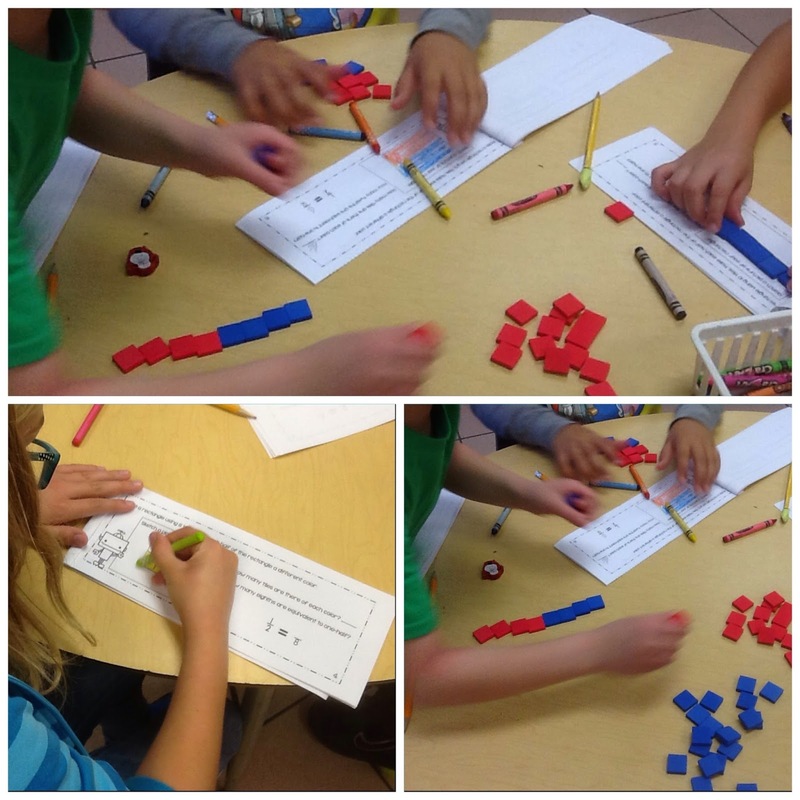 I knew that they did not have a strong enough understanding of equivalent fractions to forgo using concrete manipulatives. I also included writing in math pages (like page 9 shown above) in student booklets to give students practice explaining the concepts in their own words. They did a great job on this activity. If you would like to purchase the booklet you can get it by clicking the picture below. Right now it is priced at $1.00. Buy now by clicking the cover.